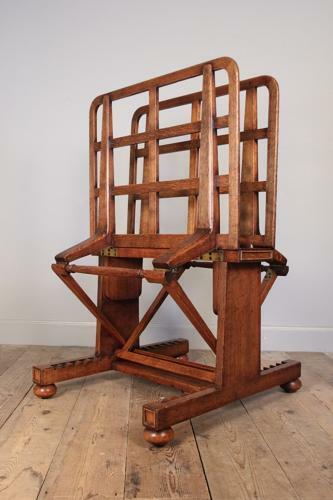 A wonderful quality George IV solid Oak Folio Stand with great London provenance. This adjustable stand with lattice supports, raised on trestle ends with bun feet of which retain the original brass inset castors. Superb colour, lustre and condition throughout. English, Circa 1830. Attributed to Gillows*. This folio stand comes from the Stanley Studios, Studio 5, Peter Collins. Chelsea London. The Stanley Studios had a wonderful cultural pedigree, occupied by artists such a Elisabeth Frink, Jack Smith and Peter Collins himself. *We have images on file of the same Oak model of folio stand stamped by Gillows and removed also from the Stanley Studios, Chelsea.